Adelnews is an on-line magazine for members of the Adelphikos Fraternity, Grove City College, from 1913 to the present. Although the idiot administration at GCC has "excommunicated" the Adels from the campus, we live on in memories and on the internet. Perhaps someday as a part of the efforts of the Adel alumni, the fraternity will be reinstated. Our goal should be to do this by the year 2013, the 100th anniversary of the fraternity. This magazine is dedicated to perpetuating the Adels, bringing news to Adels around the world, and giving all of us a method of jagging the hell out of each other!!! Hope you have enjoyed reading about the Adels. They are alive and well and living all around the country. George Socher (Moon Mullins) returned to GCC for homecoming and partied with all of his Adel brothers. Of course, Moon is an accountant and is a vice-president for Wabtec, the old Westinghouse Air Brake division. 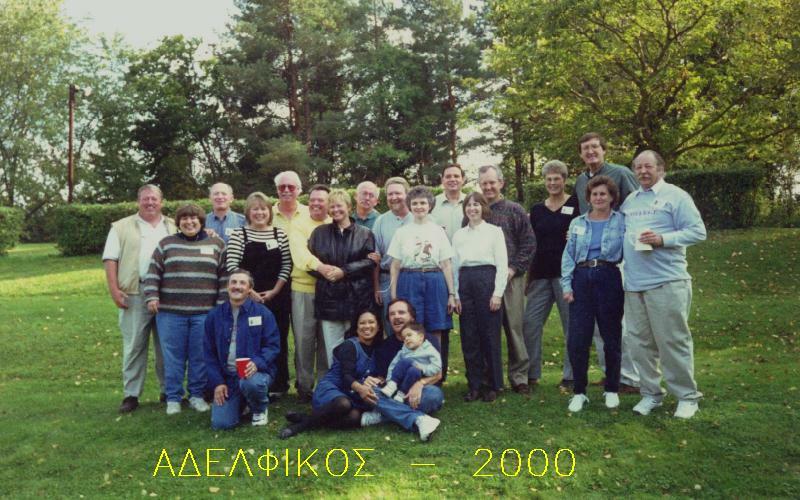 Critter (Jay Curran) '70, Organized a great reunion for the Adels on September 29-30, 2000. He also had a lot of help from Rob Taubel ('71) who was unable to attend. Arriving late due to a traffic jam in Columbus, Critter got things going when he arrived late Friday night. He and Cindy arranged for a dinner at My Brother's Place (which is the old Lone Pine Inn) on Saturday Night. Bill Shawgo had a roundup at his mother's place just outside of town. We all talked about the old times and listened to the Doors. Adel photo album page this month. How about setting a goal to reinstate the Adels at GCC by the year 2013? Even sooner would be great. We could use a volunteer to spearhead this effort. It would be nice to see the black cat raised again on campus for the Adel's 100th anniversary. Many of you wrote letters to the college to demand reinstatement. Don't give up. It's time for another letter from each of us before the Grove City College academic year ends.